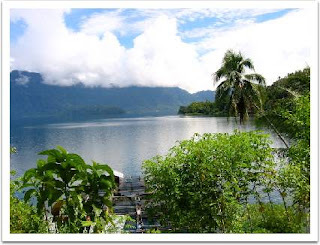 Maninjau Lake West Sumatra, is one of the most splendid lakes in Indonesia. This volcanic lake is situated more or less 461 meters above sea level. This lake, 100 m2 in size with the maximum depth of 500 meters, is associated with a legend. It is said that from the local folklore called "Bujang Sembilan" (roughly translates as "Nine Young Men"), one of these men died by plunging himself to the crater. The crater then expanded, forming a lake.